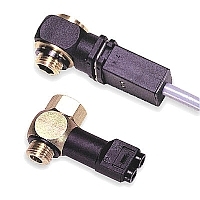 Pneumatic Threshold Sensors by Legris Division of Parker detect pressure drops and are generally used to detect the end-of travel of a cylinder piston, wherever it may be. They produce an end-of-stroke signal, pneumatic or electric, when the exhaust back pressure in the cylinder disappears. They can be mounted on the cylinder or on the control valve.